Hysteria over salvia divinorum, the fast-acting, short-lived psychedelic member of the mint family, continued in state legislatures this year. Although after five years, the DEA has not found a reason to add salvia to the federal list of controlled substances, that hasn't stopped state legislators from trying. This year, four more states joined the list of those that have criminalized it, while bills to do the same were introduced in seven others. Next week, we will conclude our review of drug policy-related issues in state legislatures with a look at sentencing reform, drug testing, meth-related measures, and some odds and ends. Nebraska: Salvia Divinorum became a Schedule I controlled substance in February, after LB 123 passed the unicameral legislature on a 44-0 vote that same month. The governor quickly signed the bill. North Carolina: A bill to prohibit the use, possession, sale, or manufacture of Salvia Divinorum, SB 138, passed the House on a 45-0 vote in May and the Senate on a 96-15 vote in August. It was signed into law that same month and went into effect December 1. Ohio: Salvia Divinorum became a Schedule I controlled substance in April, 90 days after Gov. Ted Strickland (D) signed a bill banning the plant that passed the legislature late last year. South Dakota: Possession of less than six ounces of salvia divinorum became a misdemeanor and possession of more became a felony after HB 1090 passed the House 67-2 and the Senate 34-0 in February. Gov. Mike Round (R) signed the "emergency" legislation in March, and it went into effect immediately. Curiously, the bill does not criminalize salvia sales. Alabama: A bill to make Salvia Divinorum a Schedule I controlled substance, HB 475, was introduced in February. It was assigned to the Judiciary Committee, where it has been sitting since May. Kentucky: A bill to make Salvia Divinorum a Schedule I controlled substance, HB 228, passed the House on a 99-0 vote in February and was referred to the Senate Judiciary Committee, where no action has since occurred. Maryland: A bill to make Salvia Divinorum a Schedule I controlled substance, HB 8, died in March after being reported unfavorably out of the House Judiciary Committee. A companion bill, SB 9, died without any action being taken. Michigan: A bill to make Salvia Divinorum a Schedule I controlled substance, HB 4849, was introduced in April, referred to the Committee on Health Policy and promptly went nowhere. Its companion measure, SB 570, met a similar fate. New Jersey: SB 2436 and its companion measure, AB 1323, would make Salvia Divinorum a Schedule I controlled substance. Both were both introduced at the end of 2008 for the 2009-2010 legislative session, and neither has gone anywhere. Pennsylvania: A bill to make Salvia Divinorum a Schedule I controlled substance, SB 769, was introduced and referred to the Senate Judiciary Committee in April. It hasn't moved since. A companion measure, HB 2037, was introduced in October and sits before the House Judiciary Committee. Texas: A bill that would make it a crime to provide Salvia Divinorum to minors, SB 257, was introduced last November. It was passed by the Senate Judiciary Committee on a 30-1 vote in April. In the House, the bill was approved by the Criminal Jurisprudence Committee in May, and has done nothing since. Another bill, HB 126, which would make Salvia a controlled substance in Penalty Group III (along with LSD and pentobarbital, among others), was introduced last November, referred to the House Criminal Jurisprudence Committee in February, and allowed to die there in March. Join Daniel Pinchbeck, bestselling author of 2012: The Return of Quetzalcoatl and Breaking Open the Head, on a 4 - part journey of discovery and illumination, exploring a deeply controversial and mysterious subject that has profound implications for the future of the self (yes, you), our society and our world. This first Reality Sandwich Intensive will explore promising, fascinating, liberating and often taboo possibilities of psychedelic substances, such as LSD, mushrooms, iboga, ayahuasca and peyote. October 28th teleseminar: Ever wonder who is doing the hard research on the therapeutic value of pscychedelics, MDMA, medical Marijuana, etc? Have you wanted to get beyond the rumors and the propaganda? Well, Rick Doblin, Ph.D., Executive Director of the Multidisciplinary Association for Psychedelic Studies (MAPS) is exactly the man you want to talk to, and you will, in this live call. Bringing almost 25 years of research to our discussion, Rick will explore… * How psychedelics are valuable tools with specific roles and breakthrough potentials at different points throughout the life span. * Why non-profit psychedelic and medical marijuana drug development is a sensible, practical -- and essential -- practice today * Why psychedelics are one of the most important paths to healing the trauma of war and ameliorating anxiety associated with end-of-life. * Why even in this seemingly boundary-less world of psyedelic exploration, . scientific methodology is king -- and what each of us has to learn from that. * What the non-experimental world needs to know about psychedelics, and how you can be an ambassador of truth and transformation. About Rick: Rick founded the Multidisciplinary Association for Psychedelic Studies (MAPS) in 1986. His dissertation (Public Policy, Harvard’s Kennedy School of Government) was on "The Regulation of the Medical Use of Psychedelics and Marijuana," and his master’s thesis (Harvard) focused on the attitudes and experiences of oncologists concerning the medical use of marijuana. His undergraduate thesis (New College of Florida) was a twenty-five year follow-up to the classic Good Friday Experiment, which evaluated the potential of psychedelic drugs to catalyze religious experiences. He has also conducted a thirty-four year follow-up study to Tim Leary’s Concord Prison experiment. Rick studied with Stan Grof, M.D., and was in the first group to become certified as holotropic breathwork practitioners. His professional goal is to help develop legal contexts for the beneficial uses of psychedelics and marijuana, primarily as prescription medicines but also for personal growth for otherwise "healthy" people, and to also become a legally licensed psychedelic therapist. He resides in Boston with his wife and three children. www.maps.org ----------------------------------------- How Do Psychedelics Heal? Repressed and reviled since the 1960s, these substances are now getting a second look in many areas. Researchers around the US and abroad are completing groundbreaking studies on the value of psychedelics for treating depression, mental illness, for alleviating the fear of death in terminally ill cancer patients and healing Post Traumatic Stress Disorder in Iraqi Vets. The US Supreme Court recently awarded legal protection for the sacramental use of ayahuasca, a visionary drink from the rainforest, to the Unaoi do Vegetales, a religion founded in Brazil. Meanwhile, thousands of Western spiritual adventurers have been going to Central and South America to take plant-based psychedelics with tribal groups and Mestizo shamans -- including many in our Reality Sandwich and Evolver Communities. You Will Speak Directly To Thought-Leaders and Psychedelic Pioneers… During, this, our first Reality Sandwich Intensive, a series of four intimate conference calls, we will speak with thought-leaders and researchers at the forefront of discovery in this exciting and edgy field. When you join the series, you will have the chance to ask your questions and share your concerns with our experts. The series will include ancillary material and a live forum on our companion social network, Evolver.net so you can connect with others, both newbies and edge-walkers, in our community -- to deepen your insight, knowledge and human connections with like-minded people. Together, we will explore the following questions: * What is the value of the psychedelic experience for people in our society? * How can we frame this value in a powerful new language that can help pave the way for more powerful discussion and transformation? * What are the true dangers of psychedelics? Some people have had "bad trips." What are the most effective ways to address the psychic and emotional scars that can accompany the sometimes shocking illuminations produced by visionary substances? How can you assist someone who is in the throes of a negative experience? * While most psychedelics remain illegal in the US, it is possible to have legal experiences with visionary plant-based psychedelics in South America, Africa, and elsewhere. How can one find a trusted shaman or native guide for these explorations? * What is the connection between psychedelic use and innovations in fields ranging from art and music to biology and software development? * Is there any connection between psychedelics and the world's mystical traditions, such as Hinduism, Gnosticism, and Qabala? * Why were psychedelics suppressed and demonized in the past? Are there reasons to think that our society is prepared to reconsider them today? If so, what can we do to advance that evolution? To guide us through these fascinating and illuminating discussions, we have gathered some of the world's leading thinkers and spiritual explorers. You Can Be A Part of This Intensive… Participation in this important and landmark series is only $50. As an active participant, you will… Participate in each of the live calls and have the opportunity to have your most pressing questions and challenges answered by our guest teachers. Receive a recorded copy of each of the calls for download once the call is over, for your review and audio library (and, in case you have a scheduling conflict). Participate in our new exclusive "EvolverIntensives - Psychedelics " online forum where you can meet the other participants, share ideas, tips, tools, questions and knowledge. We created the Evolver Intensives to bring you the best, most useful and most inspiring thought leaders alive today to help you prepare for, and thrive in, a time of radical change. We deeply appreciate your support and your ideas, and hope you join us for this series. Once you register, we will send you all the information on how to join the calls and the online forum. For more information, see http://www.evolverintensives.com/Psychedelics/register.htm. Join Daniel Pinchbeck, bestselling author of 2012: The Return of Quetzalcoatl and Breaking Open the Head, on a 4 - part journey of discovery and illumination, exploring a deeply controversial and mysterious subject that has profound implications for the future of the self (yes, you), our society and our world. This first Reality Sandwich Intensive will explore promising, fascinating, liberating and often taboo possibilities of psychedelic substances, such as LSD, mushrooms, iboga, ayahuasca and peyote. How Do Psychedelics Heal? Repressed and reviled since the 1960s, these substances are now getting a second look in many areas. Researchers around the US and abroad are completing groundbreaking studies on the value of psychedelics for treating depression, mental illness, for alleviating the fear of death in terminally ill cancer patients and healing Post Traumatic Stress Disorder in Iraqi Vets. The US Supreme Court recently awarded legal protection for the sacramental use of ayahuasca, a visionary drink from the rainforest, to the Unaoi do Vegetales, a religion founded in Brazil. Meanwhile, thousands of Western spiritual adventurers have been going to Central and South America to take plant-based psychedelics with tribal groups and Mestizo shamans -- including many in our Reality Sandwich and Evolver Communities. You Will Speak Directly To Thought-Leaders and Psychedelic Pioneers… During, this, our first Reality Sandwich Intensive, a series of four intimate conference calls, we will speak with thought-leaders and researchers at the forefront of discovery in this exciting and edgy field. When you join the series, you will have the chance to ask your questions and share your concerns with our experts. The series will include ancillary material and a live forum on our companion social network, Evolver.net so you can connect with others, both newbies and edge-walkers, in our community -- to deepen your insight, knowledge and human connections with like-minded people. Together, we will explore the following questions: * What is the value of the psychedelic experience for people in our society? * How can we frame this value in a powerful new language that can help pave the way for more powerful discussion and transformation? * What are the true dangers of psychedelics? Some people have had "bad trips." What are the most effective ways to address the psychic and emotional scars that can accompany the sometimes shocking illuminations produced by visionary substances? How can you assist someone who is in the throes of a negative experience? * While most psychedelics remain illegal in the US, it is possible to have legal experiences with visionary plant-based psychedelics in South America, Africa, and elsewhere. How can one find a trusted shaman or native guide for these explorations? * What is the connection between psychedelic use and innovations in fields ranging from art and music to biology and software development? * Is there any connection between psychedelics and the world's mystical traditions, such as Hinduism, Gnosticism, and Qabala? * Why were psychedelics suppressed and demonized in the past? Are there reasons to think that our society is prepared to reconsider them today? If so, what can we do to advance that evolution? To guide us through these fascinating and illuminating discussions, we have gathered some of the world's leading thinkers and spiritual explorers. You Can Be A Part of This Intensive… Participation in this important and landmark series is only $50. As an active participant, you will… Participate in each of the live calls and have the opportunity to have your most pressing questions and challenges answered by our guest teachers. Receive a recorded copy of each of the calls for download once the call is over, for your review and audio library (and, in case you have a scheduling conflict). Participate in our new exclusive "EvolverIntensives - Psychedelics " online forum where you can meet the other participants, share ideas, tips, tools, questions and knowledge. We created the Evolver Intensives to bring you the best, most useful and most inspiring thought leaders alive today to help you prepare for, and thrive in, a time of radical change. We deeply appreciate your support and your ideas, and hope you join us for this series. Once you register, we will send you all the information on how to join the calls and the online forum. For more information, see http://www.evolverintensives.com/Psychedelics/register.htm. In the last eight days, the decriminalization of drug possession has gone into effect for 150 million Latin Americans. 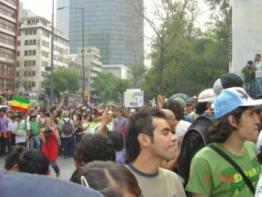 Last Thursday, as part of a broader bill, Mexico (pop. 110 million) decriminalized the possession of small amounts of all drugs through the legislative process. Four days later, the Argentine Supreme Court declared unconstitutional that country's law criminalizing drug possession. While the Argentine case involved marijuana possession, the ruling clears the way for the government to draft a new law decriminalizing all drug possession. The shift in policies toward drug users in the two countries is a dramatic indication of the seismic shift in drug policy already well underway in Latin America. Colombia's high court declared the law against drug possession unconstitutional in 1994. Brazil has had a version of decriminalization since 2006 -- users cannot be imprisoned, but can be forced into treatment, educational programs, or community service -- and Uruguay now allows judges to determine if someone in possession of drugs intended to use them or sell and to act accordingly. Movement toward decriminalization is also underway in Ecuador. That reformist zeitgeist is perhaps best encapsulated in the Latin American Commission on Drugs and Democracy, led by former presidents Cesar Gaviria of Colombia, Ernesto Zedillo of Mexico, and Enrique Cardoso of Brazil. In its report earlier this year, Drugs and Democracy: Toward a Paradigm Shift, the commission called for decriminalization of drug use, especially marijuana, and treating drug use as a public health -- not a law enforcement -- issue. A similar commission got underway in Brazil last week. "Decriminalization permits a distinction between users and drug traffickers," said John Walsh of the Washington Office on Latin America. "This allows governments to focus their efforts in reducing the terrible harms caused by the big criminal networks and the violence related to the illicit traffic, instead of repressing users and small-scale dealers." "What's happened in Mexico and now Argentina is very consistent with the broader trend in Europe and Latin America in terms of decriminalizing small amounts of drugs and promoting alternatives to incarceration and a public health approach for people struggling with drug addiction," said Ethan Nadelmann, executive director of the Drug Policy Alliance. "The decision in Argentina reminds me of similar rulings in Colombia more than a decade ago and in Germany before that, and, more generally, what's been going on in the Netherlands, Portugal, and Switzerland. In some cases, there is a legal or constitutional notion about personal sovereignty or autonomy, but there is also a recognition of the failures of the drug war approach vis a vis low-level offenders. There is a kind of human rights element that you see popping up in both contexts," Nadelmann said. For Mexican drug reformers, the law is definitely a mixed bag. The Collective for an Integral Drug Policy, a Mexico City-based reform think-tank, felt compelled to note that while "the law represents certain advances... it could have very negative consequences for the country" because the public health and human rights perspectives are not implicated strongly enough in it. While the collective applauded the law's distinctions between consumer, addict, and criminal; its rejection of forced drug treatment, its lip service to harm reduction, and its recognition of the traditional, ritual use of some substances, it challenged other aspects of the law. "It focuses on intensifying a military and police strategy that has proven to be a failure," the collective said, alluding to the more than 12,000 people killed in prohibition-related violence since President Felipe Calderon unleashed the military against the cartels in December 2006. "The law will criminalize a vast group of people who make a living off the small-time dealing of drugs, but who in reality do not consciously form part of organized crime," but who are instead merely trying to make a living, the collective argued. "Imprisoning them will not diminish the supply of drugs on the street, nor will it improve public security, yet it will justify the war on drugs, since the government will be able to boast of the number of people incarcerated with this policy." "Mexican decriminalization will have no impact whatsoever on the broader issues of drug trafficking and violence," agreed Nadelmann. "From the legal and institutional perspective, this is very, very significant, but in terms of actual impact on the ground in Mexico, that remains to be seen." The collective also criticized the law's provision allowing police to make drug buys to nab small-time dealers and warned that the small quantities of drugs decriminalized "are not realistic" and will as a consequence lead to "a significant increase in corruption and extortion of consumers by police forces." University of Texas-El Paso anthropologist Howard Campbell, who has studied the street drug scene across the river in Ciudad Juarez, was more cynical. "It was a good move by the government to make that distinction between users and traffickers, but I'm not sure what the effects of the law will be," he said. "All over Mexico, cops prey on junkies, and one effect of this might be to give low-down junkies a bit of a break from the cops. On the other hand, street-level drug dealing is often controlled by the cops... but if the cops are corrupt and in control, it doesn't really matter what the law says." Campbell also doubted the new law would have much effect in reducing the prohibition-related violence. "I don't think it will have much initial impact, but still, the overarching importance of this law is symbolic. It shows that governments can revamp their policies, not just keep on working with failed ones," he said. In Argentina, the situation is less dire and the reform is less ambiguous. On Tuesday, the Argentine Supreme Court, ratifying a series of lower court decisions in recent years, declared that the section of the country's drug law that criminalizes drug possession is unconstitutional. While the ruling referred only to marijuana possession, the portion of the law it threw out makes no distinction among drugs. The decision came in the Arriola case, in which a group of young men from the provincial city of Rosario were each caught with small amounts of marijuana, arrested, and convicted. Under Argentina's 1989 drug law, they faced up to two years in prison. But imprisoning people absent harm to others violated constitutional protections, a unanimous court held. "Each individual adult is responsible for making decisions freely about their desired lifestyle without state interference," their ruling said. "Private conduct is allowed unless it constitutes a real danger or causes damage to property or the rights of others. The state cannot establish morality." "It is significant that the ruling was unanimous," said Martin Jelsma, coordinator of the Drugs and Democracy program at the Transnational Institute, which has worked closely with Latin American activists and politicians on drug reform issues. "It confirms the paradigm shift visible throughout the continent, which recognizes that drug use should be treated as a public health matter instead of, as in the past, when all involved, including users, were seen as criminals." That paradigm shift has also occurred within the current Argentine government of President Cristina Kirchner, which favors a public health approach to drug use. The government has been waiting on this decision before moving forward with a bill that would decriminalize possession of small quantities of all drugs. "The declaration of the unconstitutionality of the application of the drug law for marijuana possession is a great advance since it eliminates the repressive arm from a problem that should be confronted with public health policies," said Intercambios, an Argentine harm reduction organization. "Whatever retreat in the application of the criminal law in relation to drug users is positive; not only to stop criminalizing and stigmatizing users, but to permit the advance of educational, social, and health responses that are appropriate for this phenomenon." Some Argentine harm reductionists warned that while the ruling was of transcendent importance, its real impact would be measured by its effect on the policies of the state. "In the vertical sense, it should oblige all the judges in the country to take heed of this declaration of the unconstitutionality of punishing drug possession for personal use," said Silvia Inchaurraga of the Argentine Harm Reduction Association (ARDA). "In the horizontal sense, it should force all the agencies of the state involved in drug policy to redefine their involvement to guarantee that they do not fail to comply with international human rights treaties subscribed to by the country," she added. For the Argentine section of the global cannabis nation, it was a happy day. "Wow! This feels like honest good vibrations from the Supreme Court and the government," said Argentine marijuana activist Mike Bifari. "They really do have this new policy of generally being more tolerant and talking about human rights in the drug issue nationally and internationally, instead of that tired old war on drugs." The Supreme Court decision will pave the way to full decriminalization, he said. "Although this was a marijuana case, the current law is about all types of drugs," said Bifari. "Now we have to wait for the government's scientific committee to come up with a draft of a new drug law, and that will be the government's bill in the congress. We think there are going to be lot of media debates and lots of discussion, and what we will try to do is to occupy all the different cultural spaces and try to advance on issues such as access and medical marijuana." And so the wheel turns, and the United States and its hard-line drug policies are increasingly isolated in the hemisphere. As anthropologist Campbell noted, "This is happening all over Latin America. You'd think we might be able to do it here, too." The Tarheel State is about to become the latest to ban salvia divinorum, the potent but fast-acting hallucinogen that has become increasingly popular among young drug experimenters in recent years. A bill that would do that, SB 138, now sits on the desk of Gov. Beverly Perdue, who is expected to sign it. Last week, the House approved the measure by a vote of 94-15. It earlier passed the Senate on a unanimous 45-0 vote. The bill makes possession of salvia an infraction, a minor crime punishable by a maximum $25 fine. A third possession offense would be charged as a misdemeanor. The bill has no separate provisions for charging manufacturing or sales offenses. The bill includes two exemptions. The first is for ornamental gardening; the second is for university-affiliated researchers. North Carolina will join 14 other states and a handful of towns and cities that have banned or regulated salvia in recent years, the most recent being the resort town of Ocean City, Maryland, earlier this month. Salvia is not a prohibited controlled substance under federal law, although the DEA is evaluating whether it should be, a process that has gone on for more than five years now. Bismarck, North Dakota, resident Kenneth Rau, the first person arrested in the US on salvia divinorum possession charges, was sentenced Tuesday to a deferred sentence. Rau had pleaded guilty the same day to Class C felony possession of salvia, as well as two misdemeanors, possession of paraphernalia and possession of marijuana. Rau was arrested in April 2008 when police looking for his son searched his home and found salvia, numerous herbs, and a bit of weed and a pipe. North Dakota legislators had banned salvia the previous year, but Rau said he was unaware of that law and obtained his salvia leaf through eBay. South Central District Judge Tom Schneider sentenced Rau to a three-year deferred imposition of sentence. That means Rau will be on supervised probation for three years, but the charges will be removed if he successfully completes it. He must also undergo a chemical dependency evaluation and any treatment if necessary, and pay $575 in court costs. Rau originally was charged with possession of salvia with intent to deliver, but that charge was reduced to drop the intent to deliver portion upon further research of the substance, Rau's attorney, Ben Pulkrabek, said. Rau had obtained about eight ounces of salvia leaf for $32. Salvia sold commercially typically comes in concentrated form, not raw leaf. Burleigh County Prosecutor Cynthia Feland recommended the deferred sentences, noting that Rau had no recent criminal history, no history of prior drug use, and had purchased the leaf on the Internet before its criminal status in the state was widely known. "Salvia is a relatively new drug having been added to the controlled substance list," she said. 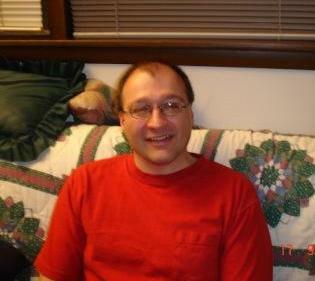 After his day in court, Rau told the Bismarck Tribune he was not surprised at his sentence. "It's kind of what I expected, "he said. "I didn't think I would get any better from a jury trial." Rau told the newspaper he did not think salvia should have been criminalized without more evidence. He also said the plant could have medicinal uses. An Ohio law criminalizing the possession of salvia divinorum went into effect Tuesday, but that didn't stop an over-eager Butler County sheriff's deputy from arresting a man for it Monday or Butler County Sheriff Rick Jones crowing about being the first to bust someone under the new law. Jones sent out a press release touting his coup at 11:00am Monday, but had to retract it before the day was over. 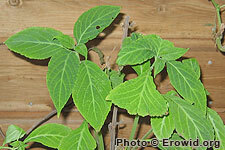 Salvia divinorum is a fast-acting, short-lived psychedelic member of the mint family traditionally used by Mazatec shamans in southern Mexico. It is not a federally controlled substance, but has been an object of concern among prohibitionist-leaning legislators across the country. Ohio is the latest of about a dozen states to pass laws criminalizing its possession or sale. But shortly after the press release went out, a sheriff's detective questioned whether the charges were premature. The detective was correct, and the felony salvia charge was dismissed. The man's marijuana and paraphernalia charges remain. "I don't have a whole lot (of sympathy) for this guy," Chief Deputy Anthony Dwyer told the Cincinnati Enquirer. "He was coming from one place to another. He admitted selling a bunch of dope in Michigan. It's not like salvia was the only thing he got arrested for." Yes, but it wasn't a crime when he got arrested for it. South Dakota has become the latest state to ban salvia divinorum, the hallucinogenic plant used for centuries by Mexican shamans whose recreational use has become noticeable in the US in recent years. Oddly enough, as the bill was amended in back and forth between the state House and Senate, legislators forgot to specifically make it a crime to distribute the herb. The bill does not go into effect until it is signed by Gov. Michael Rounds (R), who has indicated he will sign it. Once he does, the salvia ban goes into effect immediately because the bill declared an "emergency" regarding use of the fast-acting, short-duration psychedelic. The bill creates two salvia possession offenses -- a misdemeanor for possession of less than two ounces of the plant or its active substance, Salvinorin A, and a felony for possession of more than two ounces. A misdemeanor charge can earn you up to a year in jail, while the Class 6 felony would be worth up to two years in the state penitentiary. Rep. Lance Russell (R-Hot Springs) urged the House to reject the Senate version of the bill because it did not specifically outlaw distribution of salvia. But other lawmakers, eager to move ahead, said banning possession was a good enough start. 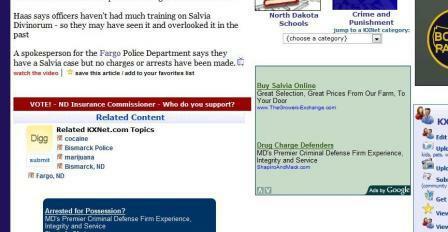 As the Chronicle noted last week, South Dakota is only the latest state to fall prey to salvia mania. Nebraska banned it a week ago, and similar measures are before legislatures in Alabama, Iowa, Maryland, Michigan, Minnesota, New Jersey, North Carolina, Ohio, Pennsylvania, South Carolina, and Texas. Thirteen states -- Delaware, Florida, Illinois, Kansas, Mississippi, Missouri, Nebraska, North Dakota, Oklahoma, and Virginia -- have classified salvia as Schedule I under state drug laws. Make that 14 now that South Dakota has joined the list. Three more -- Louisiana, Maine, and Tennessee -- restrict the sale of the plant. Maine and California ban it only for minors.